By Michael Montero – Over 13,000 fans trickled into the T-Mobile Arena in Las Vegas Saturday night to watch Sergey Kovalev put his light heavyweight titles on the line against Andre Ward. After what had been a lackluster undercard (to put it nicely), the subdued atmosphere quickly sprung to life as the fighters made their way into the ring. Not surprisingly, it was a pro-Ward crowd, as the American received cheers to the Russian’s jeers. Both men entertained the fans in a contest that turned out to be better than many expected. But when it was all said and done, the night would end in controversy. Kovalev started well in the opening round, stunning Andre Ward with a stiff jab halfway through. Ward grabbed on to regain his balance, and referee Robert Byrd let him hold for a good ten seconds or so before breaking the fighters up. The Russian controlled the remainder of the round, clearly winning it. Beaming with confidence at the start of the second round, Kovalev worked well behind the jab. About a minute in, he landed a fluid combination that pushed Ward back. Moments later, Kovalev dropped Ward with a flush 1-2 combo, shocking the partisan crowd. The American quickly sprung to his feet and held on for the remainder of the round to get his legs back. The American showed some real mettle in the third round, grappling and mauling on the inside to work his way back into the fight. He was clearly recovered from the knockdown and determined to stand his ground. However, for all of his craftiness, Andre Ward simply couldn’t figure the Russian out. Kovalev continued to stick to basics, controlling the pace over the next few rounds with educated jab and underrated footwork. 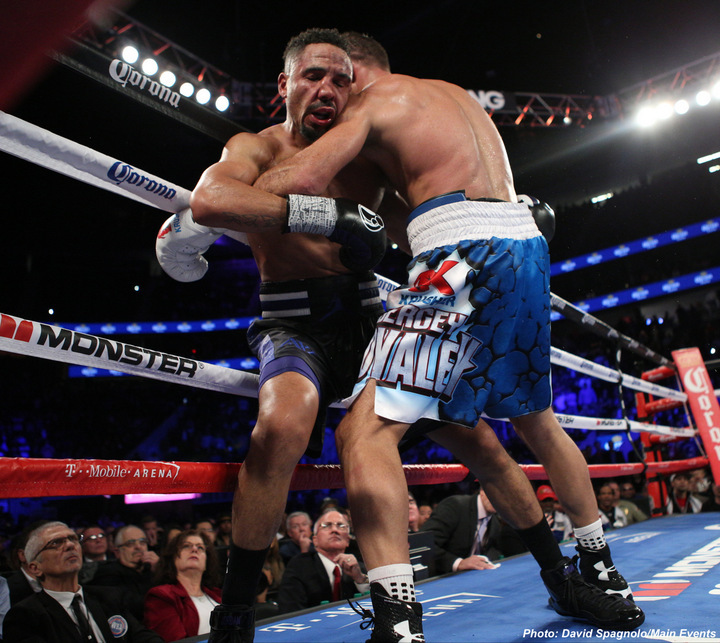 In the opening of the sixth round, Ward attempted to smother Kovalev and strangle him on the inside. Sergey held his own and got rough with his opponent, pushing him off and spinning him on the way out. Ward seemed surprised by Kovalev’s hand speed, in fact there was no discernable difference in hand or foot speed at all. At the same time, “Krusher” appeared surprised at his opponent’s strength on the inside. Ward landed a flush elbow in the opening seconds of the eighth, which ref Robert Byrd either did not see or simply didnot care to warn the American about. It was clear however that the inside fighting and “veteran tactics” were starting to work, as the American was scoring points and making things interesting as the championship rounds approached. Early in the eleventh, the fighters got tangled up, drawing the first warning from Robert Byrd to Andre Ward. He had warned Kovalev several times in the early going, but had pulled back and let both men fight through the middle rounds without much interference. Ward appeared to need a knockout going into the final round, which neither man clearly won. As the bell rang after 36 minutes of combat, the body language in the Kovalev corner seemed to be more confident than that of Ward’s, but there was plenty of tension and concern all around. Ring announcer Michael Buffer gained the attention of the crowd, announcing that all three judges saw it 114-113, then paused. The arena fell silent as all 13,310 in attendance waited. Then Buffer said, “and the NEW…” to which a mixture of cheers and boos erupted from the crowd. Kovalev landed 126 of 474 total punches (27%) and Ward landed 116 of 337 (34%). While Krusher averaged about 40 punches thrown per round, SOG averaged 28. 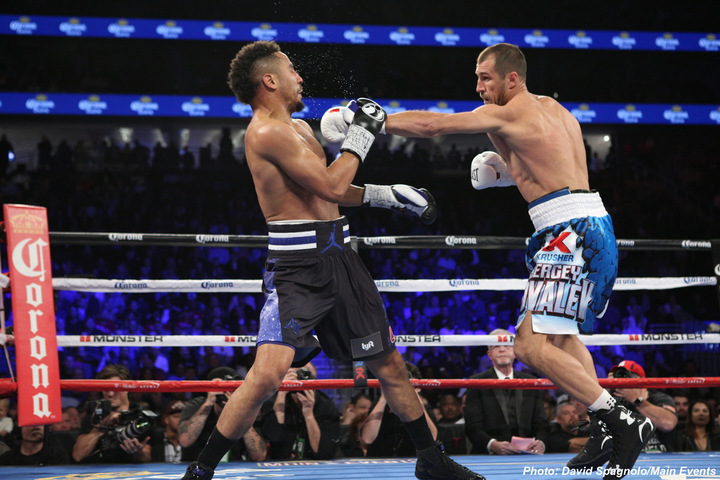 But punch numbers were only part of the story; it was truly a fight of two halves – Kovalev dominating the first half and Ward coming back in the second half. For many fans and boxing press in attendance, they simply felt that the Russian had built up too big of an early lead for the American to overcome, and found it hard to find seven clear rounds to score for Ward. Considering that there was an American ref and three American judges at an American venue on an American network in a fight between the last great hope for American boxing against a Russian fighter – in the biggest, most important match up of the year – this wasn’t exactly the best look for the sport. Kovalev’s side had demanded that a rematch clause be included in the deal to fight Ward; that turned out to be smart business. Kathy Duva of Main Events (Kovalev’s promoter) called the decision “terrible” and made it clear that they will push for an immediate rematch with Andre Ward. Roc Nation, the American’s promoter, didn’t seem to be in a hurry to talk about the rematch however. Hopefully the negotiations can get underway early next year because boxing fans will be arguing about this decision until the new, and former, light heavyweight champions of the world lock horns again.